There are 41 Assisted Living Facilities in the Middleburg area, with 3 in Middleburg and 38 nearby. The average cost of assisted living in Middleburg is $3,500 per month. This is higher than the national median of $3,346. Cheaper nearby regions include Green Cove Springs with an average starting cost of $2,500. To help you with your search, browse the 204 reviews below for assisted living facilities in Middleburg. On average, consumers rate assisted living in Middleburg 3.0 out of 5 stars. Better rated regions include Fleming Island with an average rating of 4.6 out of 5 stars. Caring.com has helped thousands of families find high-quality senior care. To speak with one of our Family Advisors about assisted living options and costs in Middleburg, call (855) 863-8283. Middleburg, Florida, is a city located 26 miles southwest of Jacksonville with a population of approximately 13,000 persons, 15 percent of whom are seniors. Seniors seeking assisted living facilities (ALF) in this area have 62 to choose from; three of those facilities are directly within the city limits and an additional 59 are in close proximity. Assisted living facilities in Middleburg, as well as in the rest of Florida, are defined by the Department of Elder Affairs as establishments that offer residential services in a home-like environment. ALFs in Florida are divided into four separate categories, including mental health care, and are licensed by the Florida Agency for Health Care Administration. One reason seniors are drawn to assisted living in Florida is for its income tax cuts. In Middleburg and across the state, Social Security and pension income are exempt from taxation. Seniors who spend less on taxes can spend more on traveling, recreation or assisted living costs. Middleburg has an array of community resources for seniors, including the Middleburg Weigel Senior Center, an organization that offers socialization through activities such as bingo games, dance classes and Karaoke. The Middleburg area is home to world-class medical facilities, including St. Vincent's Medical Center Clay County, in the event of medical emergencies or illness. Middleburg's climate often produces summers that are long and mostly cloudy. Winters are short, but it is rainy in Middleburg almost all year round, with an average 53 inches of rain annually (compared to the national average yearly rainfall of 39 inches). Seniors who experience asthma, allergies or chronic headaches could find their conditions worsened in an area with so many storms. Middleburg experiences approximately three crimes per 1,000 residents each year, slightly lower than Florida's average 4.3 crimes per 1,000 residents annually. Seniors should be mindful of Middleburg's average crime rates when contemplating assisted living in the area. On a scale of one to 100 (with 100 being perfect air quality), Middleburg's air quality is given a score of 60, and the country's average air quality is scored at 58. Because the air quality in Middleburg is comparable to the national average, seniors cannot be guaranteed to find respiratory relief in the area. Assisted Living costs in Middleburg start around $3,500 per month on average, while the nationwide average cost of assisted living is $4,000 per month, according to the latest figures from Genworth’s Cost of Care Survey. It’s important to note that assisted living rates in Middleburg and the surrounding suburbs can vary widely based on factors such as location, the level of care needed, apartment size and the types of amenities offered at each community. 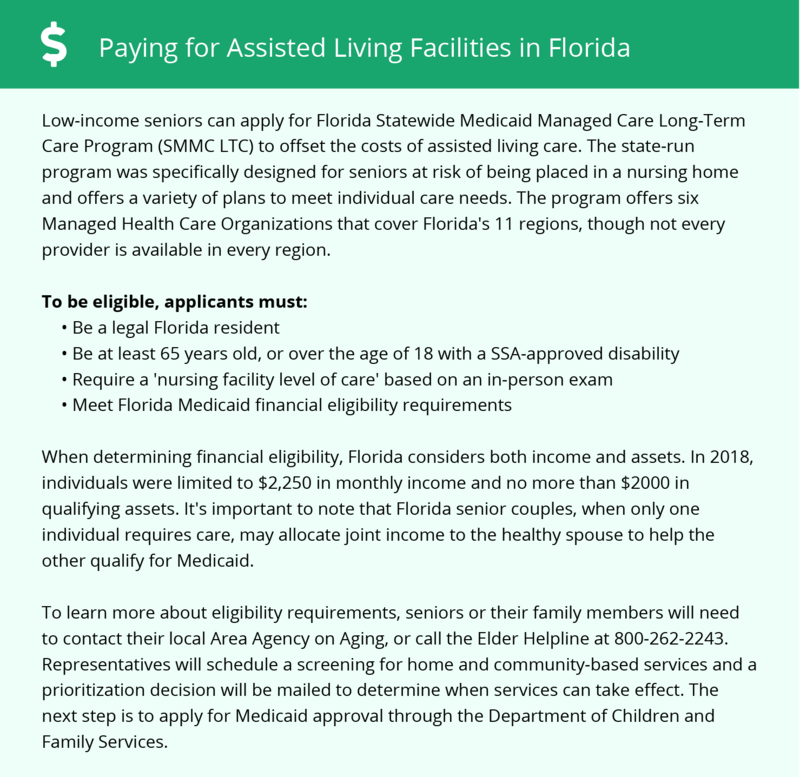 Seniors looking for financial assistance for assisted living in Middleburg should turn to the Florida Statewide Medicaid Managed Care Long-Term Care Program (SMMC LTC). As another option, Florida also funds specific ALF services through a statewide 1915(b)(c) MLTC program. Middleburg and the surrounding area are home to numerous government agencies and non-profit organizations offering help for seniors searching for or currently residing in an assisted living community. These organizations can also provide assistance in a number of other eldercare services such as geriatric care management, elder law advice, estate planning, finding home care and health and wellness programs. To see a list of free assisted living resources in Middleburg, please visit our Assisted Living in Florida page. Middleburg-area assisted living communities must adhere to the comprehensive set of state laws and regulations that all assisted living communities in Florida are required to follow. Visit our Assisted Living in Florida page for more information about these laws.